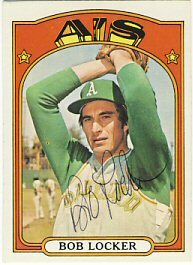 I received a few ttm requests back today and thought I better post about them. If I don't stay up on them every day, I'll fall behind forever. Tomorrow night I need to sign my boys up for baseball so I might not get too far on scanning in all my TwinsFest items. I got back a couple of paid signings items that I'll get in for sure. 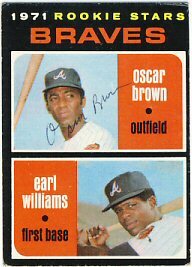 Today I got back two more 1972 Topps. Dal Maxvill and Eddie Kasko both signed their cards for me in 7 days. After the Kubel line, we went back to the main building and went through a line with Neshek, Swarzak and Frank Quilici. 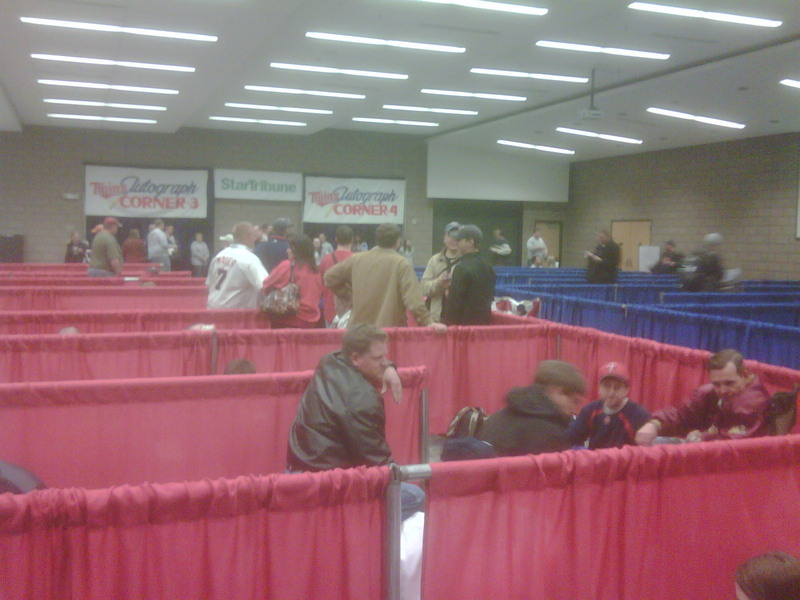 There was about 25 minutes until it closed and my son figured we might as well stay to the end so we could say we were at every minute of TwinsFest. 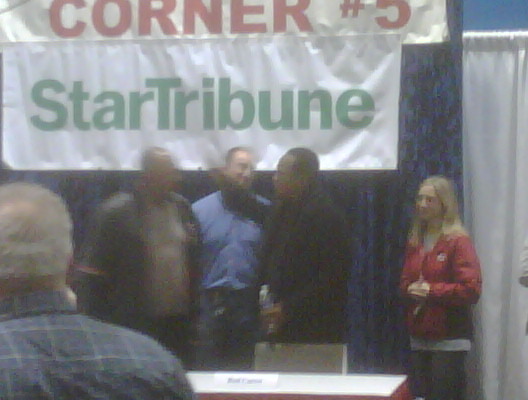 So, we were at every minute of TwinsFest. We went out to dinner and then spread all of our autographs on the dining room table for pictures, as we do every year. 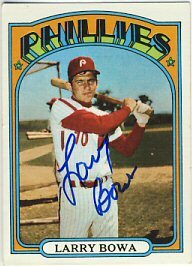 I'll probably take a break tomorrow evening, then begin the process of scanning in all of our autographs. I think this year we broke the 100 mark. As far as the overall experience, I think it went surprisingly well, considering the last minute change of venue. The only downsides were the shortage of activities for kids and having to stand outside to get in to the second building. Anyone else go? How did you think it went? Now we're waiting for Kubel, Repko, Blackburn and Jim Hoey. We made it inside now but the line is long. They're signing for another 45 minutes so I think we'll make it. We walked back to the small building to get Cuddyer and Tolbert. But, we're standing in line outside. We're regretting leaving our coats in the car! We made it through the Duensing, Perkins and Span line. Now we're killing time waiting for Cuddyer and Tolbert later. We don't want to sit in that line yet so we're looking through the dealers again. We dropped of our signed bats and coats in the car and are now in line for Duensing, Perkins and Span. We arrived in Blaine (I'm a little tired of the 45 minute drive) about 25 minutes before the doors opened to find that there weren't nearly as many people in line as we thought there might be. We're in the smaller building today, waiting for Delmon Young and Danny Valencia, but the don't start signing until 11:00. Nathan is signing in here at 9:15. If his line dwindles down to nothing, I'll have my son run over and get him for me on a 2008 All Star ball. It was a cold wait, but shorter than I expected. We're heading out to get some decent food for the drive home. The food here is not great. We got through Cuddyer's line and are sitting in the same building waiting for Nathan in the next session. This building is "full", so anyone else wanting to come in has to wait outside. The main building got very crowded. It took us 10 minutes just to make our way across to get out! 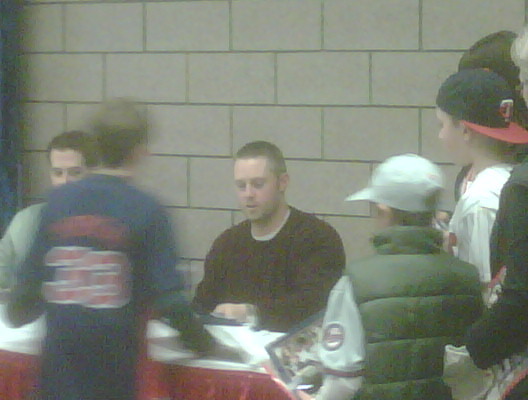 We are at the other building now waiting for Cuddyer, who doesn't sign for an hour and a half. 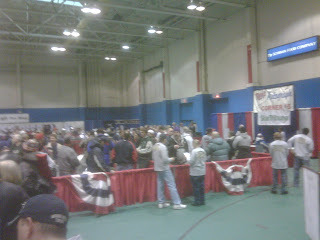 We got through Carew's line and are just killing time until Cuddyer signs at 2:30. 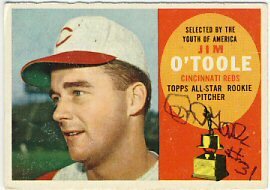 We walked around a bit looking for a '58 Topps Jim Grant for my son to get signed but came up empty. The lines for the common current players are crazy. We're waiting for Carew where Johnny's going to get a magazine signed and I'm getting a bobblehead signed. 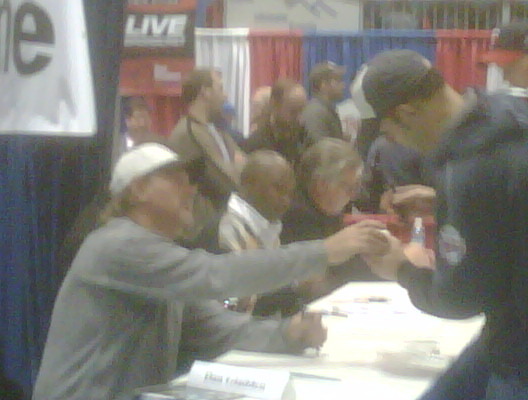 My son got Phil Niekro and Rollie Fingers to sign baseballs at the Fergie Jenkins booth. He already has Jenkins. Now I'm waiting for Reardon. I took some pictures with my camera, not my phone, so I'll post those later this week. We got through the Molitor line quickly. 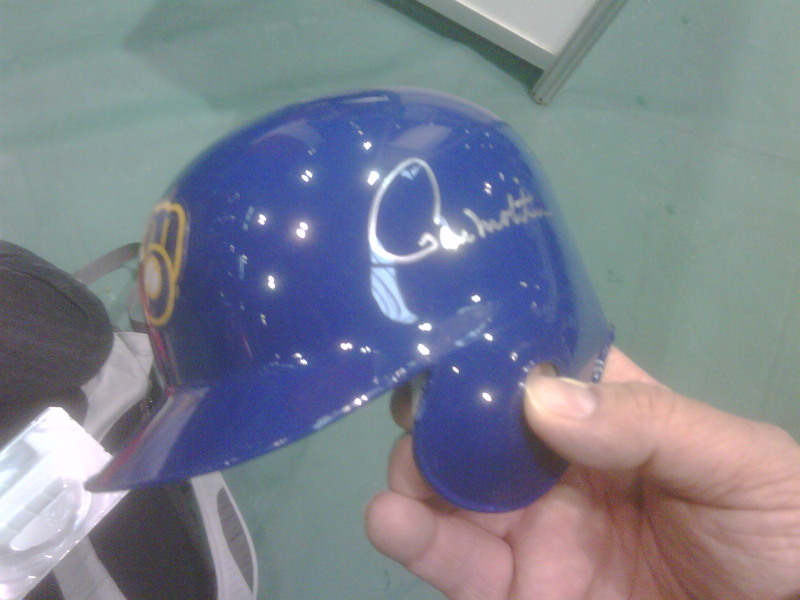 My son decided to go buy a Brewer's mini helmet and get him to sign that as well. 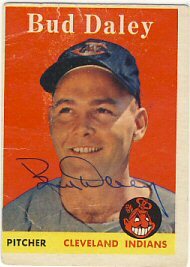 I'm waiting for Reardon to start signing with the Bob Feller Museum. 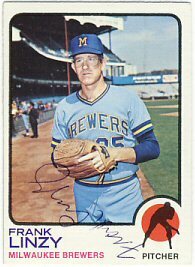 After that, we'll probably see Phil Niekro and Rollie Fingers, who are signing with the Fergie Jenkins Foundation. We waiting outside for about 20 minutes before getting inside. It's pretty crowded again. We're in line for Paul Molitor who is only signing once this weekend. The line is pretty long but we'll make it with no problem. 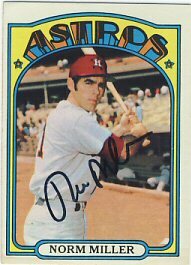 Jeff Reardon is signing today with the Bob Feller Museum. 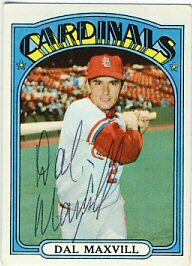 I plan to get him to sign my 1987 World Series bobblehead. We made it through the last line with Span, Baker and Perkins. It seemed like a long drive home (it's about 45 minutes for us). Other than my younger son not getting Nathan and Gardy for fear he wouldn't be able to get back into the other building to get Span, we all got everyone we planned on. Due to the smaller venue, there is less for kids to do. There used to be a place to throw a ball and see the speed on radar and other games, but this year just an inflatable bouncey thing. 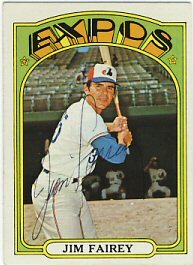 No whiffle ball, etc. It was a little chaotic and there were a few really rude people but in general it went okay. I need to get to sleep and prepare for a long day tomorrow. We headed back to the other building in hopes of getting Span, Baker and Perkins. We're not quite within the roped in area and there is about 40 minutes left. Not sure if we'll make it or not. This is the room at "the other building". I can't believe they had Mauer signing while people were waiting for Thome. No wonder the line was out the door and down the street. I should have taken my younger son's stuff to get signed for him because I could have gotten through twice easily. Now we're waiting for Cuddyer and Slowey in the same building. 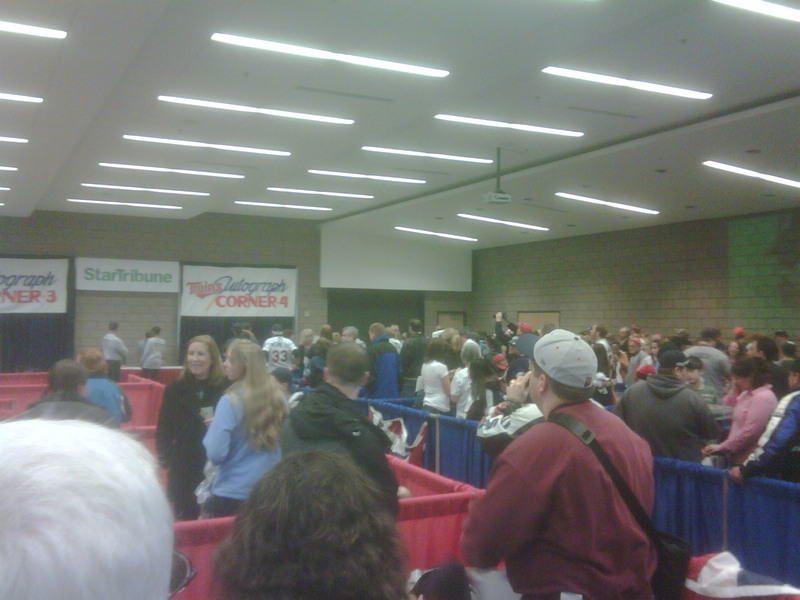 The line that my wife and younger son are in for Span is very long already, and he doesn't sign until 8:15. After getting Morris and the others, my older son and I decided to try for the other building again. We got in with no problem and are waiting for Gardy and Nathan. My younger son really wants to get Span to sign his game used cap so they decided not to risk getting shut out and are waiting back in the other building. Well, we got through the Carew and Oliva line and tried to head over to the other building. They're tracking the number of people in the buildings by scanning your ticket when you enter and leave the building, to avoid exceeding the fire code. However, the other building is full, so we hurried back to the first building in hopes of getting shut out of both! We got back in but this might cause us to change our schedule and just stick to this building. 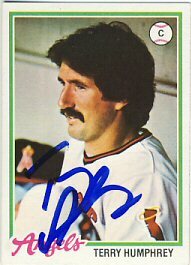 Laudner was signing with Blyleven. Now they're chatting by the ESPN radio stage. 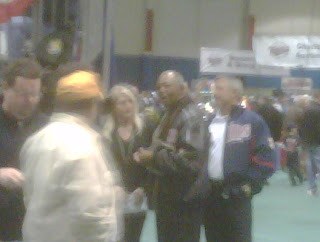 Tony Oliva's making the rounds. He signs with Carew in our line in about 20 minutes. We got through our first line really quickly and after looking through some of the dealers' stuff, we noticed Carew's line getting long so we got in line. 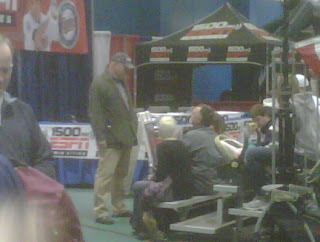 Blyleven is currently signing here now (personalizing everything) so not too many people in line to get him. 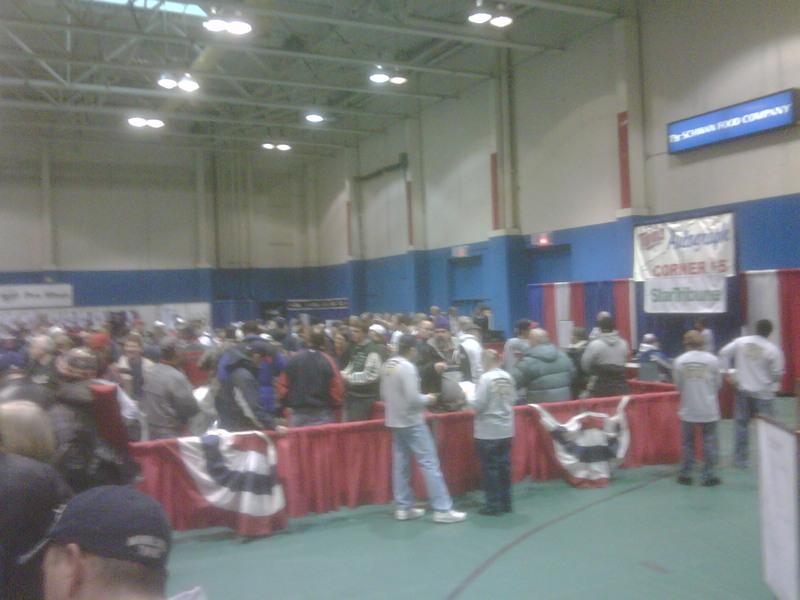 The line for the building with Mauer and Thome was crazy. We got into our building in about 10 minutes. The line for Blackburn, Kubel and Repko is short. We'll be done in 10 minutes. A few returns to catch up on over the last two days. 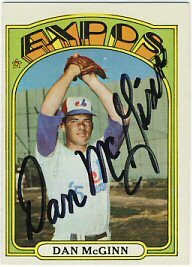 Dan McGinn signed a 1971 and 1972 Topps. 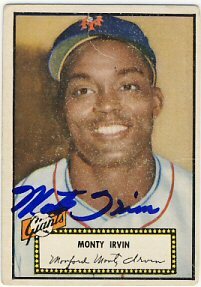 Monte Irvin signed a 1952 Topps. This was my third attempt. I never got a response to my first attempt. The second one resulted in a request for a check (even though my $10 cash wasn't returned). 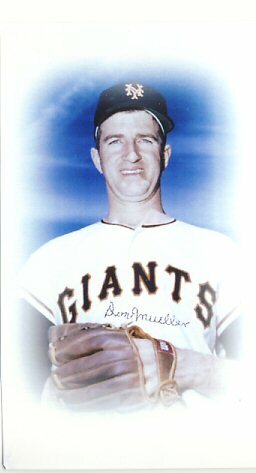 And Don Mueller wrote a short note that he misplaced my card (a 1955 Red Man) and instead sent this signed photo. I've spent the last two evenings trying to get prepared for TwinsFest. I expect tonight to be very crowded and chaotic. 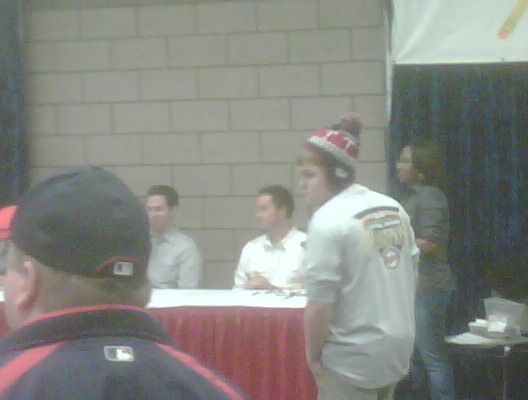 Mauer is signing in the first session (why do they do that?) 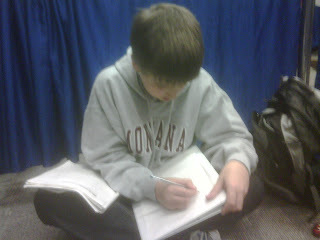 and Thome is signing during the second session, which is the only time he's appearing all weekend. We aren't going to try for either. 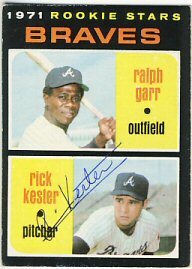 Among the missing players: Casilla, Capps, Liriano, Pavano, Morneau and of course Killebrew. 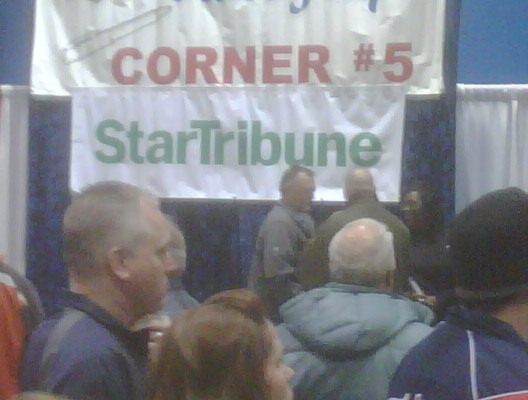 Molitor is only signing once (Saturday morning first thing). We are going to try for that one. I'll update as I have time throughout the event. According to this ESPN article, the Twins have asked Justin Morneau to skip TwinsFest and continue training it Arizona to recover from his concussion. They keep trying to say that he's doing fine, but if he can't travel to Minnesota from Arizona for a weekend event, can he really be doing that well? I have to wonder if his recovery isn't going as well as they say it is. And what does this mean for TwinsFest? I noticed his name is no longer on the list to appear. 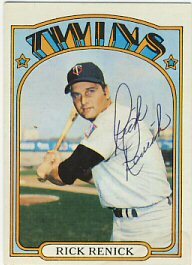 No Morneau, no Killebrew, Blyleven personalizing everything. 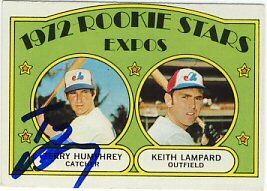 Not that I would try to get in Morneau's line, but all the people that would stand in his line will now be in other lines instead. Thome isn't on the list yet, but hopefully he'll be there. 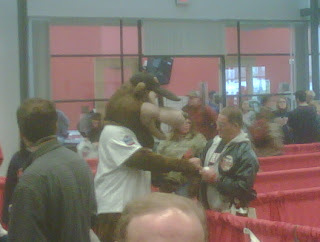 Otherwise, Mauer will be the only really big attraction. 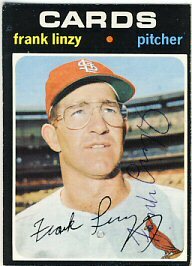 And Frank Linzy signed a few cards for me: 1965, 1971, 1972 and 1973 Topps. 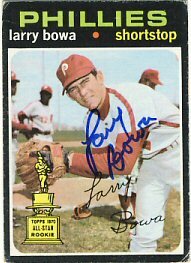 This brings my 1972 Topps set total to 151 signed cards, or about 37.75% of my goal of 400 cards. No TwinsFest schedule out yet. I'm hoping to get it as soon as possible so I can organize my binder of cards and pictures. 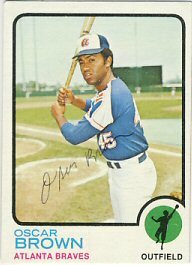 Bob Locker and Ernie Banks - And What's Up With Blyleven? Another return and a purchase. 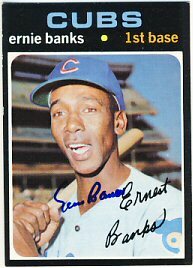 First, I bought a 1971 Topps Ernie Banks from Steve on SCN, who got me the Gates Brown card signed. 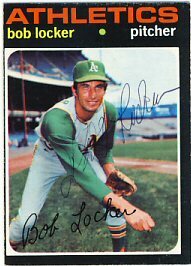 Also, Bob Locker signed his 1971 and 1972 Topps. I'm not real happy about this. It's not very fan friendly. 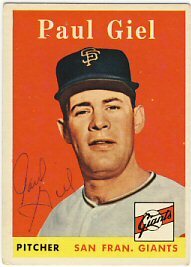 A lot of people wrote about how he should be in the Hall of Fame and a lot of fans supported him. Is this how he thanks them? 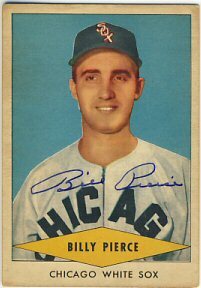 I'm sure his price will be $30 this year, like the other Hall of Famers. For $30, I wouldn't expect that my item would have to be personalized. It looks like Bert has signed a contract with MAB. 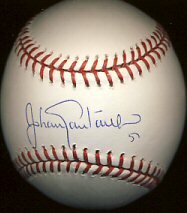 They are selling baseballs with his HOF inscription for $105! Wow, Bert didn't waste any time cashing in on his Hall of Fame election. 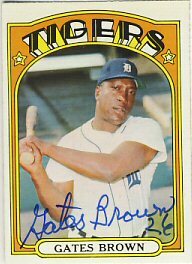 An fellow SCN member was kind enough to get a Gates Brown 1972 Topps signed for me at the Gibralter Trade Center in Taylor, Michigan. Thanks again Steve! 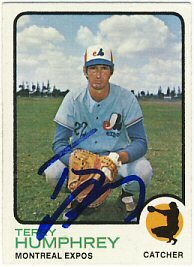 Steve is also the one who got me the Milt Wilcox autograph at the same place. I also received a few Ebay purchases. 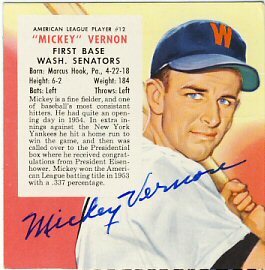 I bought a Paul Giel signed 1958 Topps, and a 1955 Red Man signed by Mickey Vernon. Both those players are deceased. A couple of great returns today. 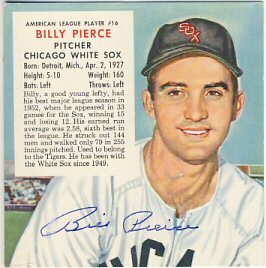 First, Billy Pierce signed two cards for me: a 1953 Red Man and 1954 Red Heart (that's dog food, "The Big League Dog Food"). 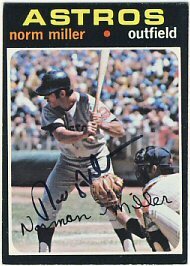 Also, Norm Miller signed his 1971 and 1972 Topps. 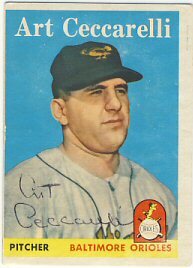 My older son also got back three more 1958 Topps: Art Ceccarelli, Bud Daley and Randy Jackson. After buying my son a Johan Santana ball, the SCN member still had one left so I bought one for myself. It arrived today. Like the last one I bought, this one is mlb authenticated, signed in February of 2010 at an MLBPA signing. I'm really liking the Red Man cards I'm getting back. 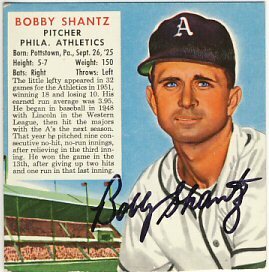 Today I received Bobby Shantz on a 1952 Red Man. I've got three more I've sent out and am hoping to get back soon. 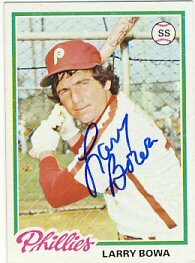 I also got Larry Bowa on 1971, 1972 and 1978 Topps. 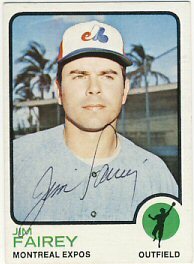 Terry Humphrey signed his 1972, 1973 and 1978 Topps. 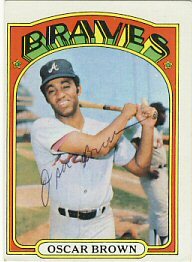 And Oscar Brown was kind enough to sign his 1971, 1972 and 1973 Topps. I also received a whole stack of old Twins Programs I bought on Ebay. They are from the '70's and '80's. I'll scan some in on a day when I have no returns to share. 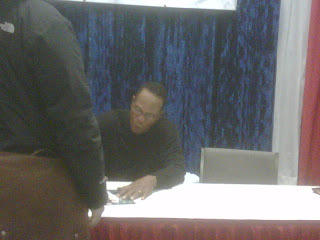 No bats, jerseys or HOF inscriptions"
So, if I'm reading this right, he won't sign a baseball unless he personalizes it? I"m glad I already got one! And isn't a "program" also a "flat item"? 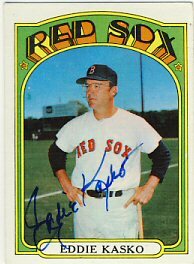 So, will he sign a program that isn't signed by someone else? I don't get it. I think I'll play it safe and skip his line altogether. I have a ball, bobblehead and a couple of programs already. It feels like spring! I'm watching a replay of the Twins versus the Mets from last year on FSN North. 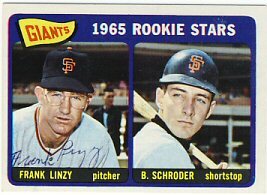 Just about 6 weeks until spring training! I got a lot of returns today, both successes and failures. 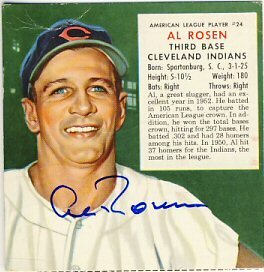 First, Al Rosen signed his 1953 Red Man. 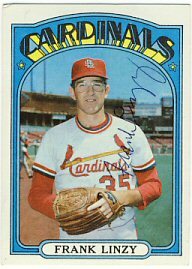 I've sent out a few of these old Red Man cards in an attempt to get back into some real vintage cards. 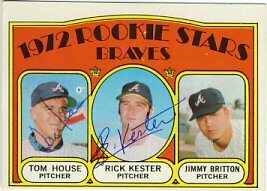 Rick Kester signed his 1972 and 1972 Topps (which was already signed by Tom House). 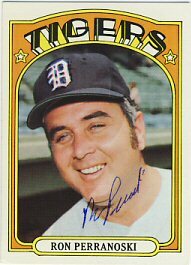 Rick Renick and Ron Perranoski signed their 1972 Topps. 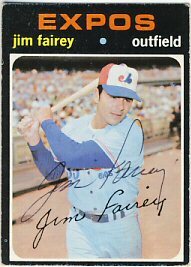 Jim Fairey signed a 1971, 1972 and 1973 Topps. 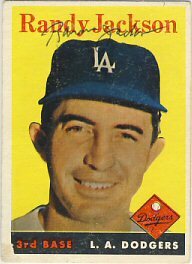 I got a 1952 Topps back unsigned from Monte Irvin with a request for a $10 check made out to him. I'm not sure what happened to the $10 cash I included. 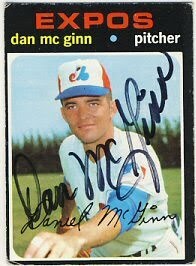 I also got a RTS from Dan McGinn. I'll correct the address and re-send.